Pleasant Living: Baby Makes Three . . .And, I Mean It This Time! Baby Makes Three . . .And, I Mean It This Time! Meet Gladys. She is the new addition to our family. By this time, y'all are probably thinking that Brian and I are some kind of dog fanatics, and you're right. Early Saturday morning, I was trotting along through our neighborhood with Vito and Samson, enjoying our luxurious new harnesses, when I was caught off guard by an enormous beast - an English Mastiff. I had no idea what kind of dog this was, until I asked the fearless owner. Quickly, I rushed home and woke up my snoozing husband, and said, "Brian, guess what kind of dog we saw this morning on our walk?" 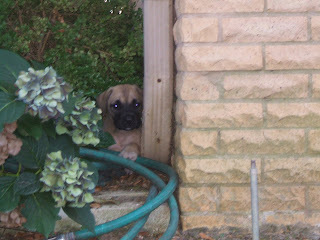 Of course, he had no idea, so I replied, "An English Mastiff. That was an awesome dog!" Brian's eyes all of a sudden lit up as he said, "I love those dogs. They're HUGE! We should get one." So, the research began. All day long we started reading online about the breed. Brian already knew tons about them, but I was totally clueless. 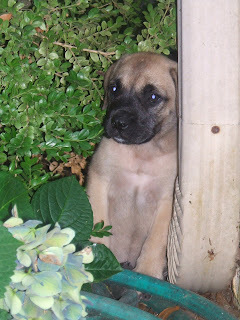 By about 2:00pm, we'd found a breeder about an hour away, so we jumped in the car, loaded with cash. Because, everyone knows that if you go "look" at a puppy, you might as well say, "I'm going to buy a puupy." Who can resist puppies? 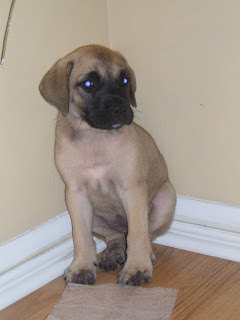 So, we're now the proud owners of a six-week-old registered English Mastiff named Gladys. She's precious. Now, I have to enjoy her small size while I can. The vet told us yesterday to prepare for her to be about 40lbs. by the time she's 12 weeks. Right now she tips the scale at 7 1/2 lbs. And, her mom and dad are both over 150 lbs, so we'll see in about 10 short months exactly how large a giant we have on our hands. YEAH! I love doggies! She is so cute! I love puppies! I can't wait to see how big she will get. I bet she will be huge! I have a dachshund that is 11 lbs. He is quite the handful. I am dogsitting right now so we have a little pomeranian running around our house. He is a little puff ball. You are brave to have 3! Congrats on your new addition! I'm a dog person too, but I'm stopping at two. So...who is going to be on poop control for Gladys, especially when she's full grown??? I have to admit. He does melt my heart. He is absolutely ADORABLE. Give him a kissy for me. 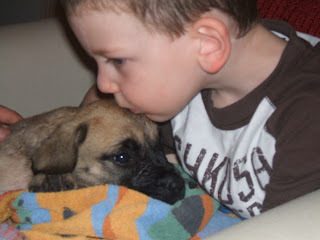 Love the Maddox pic. He is a love. Give him a cousin. In a few years, though. Enjoy being alone. wowza! cute little one. sounds like you will have a house full in a couple months! OMG I hope you have a GIANT yard! Wow, those dogs are huge! That puppy is so cute though. I just stumbled on your blog and was amazed with three dogs! We have two cocker spaniels and want to pull our hair out! What is your secret? Sooooo Cute! Having 3-two year old kids is almost the same....right??? He is such a joy. Just like having a huge piece of furniture around. And we're so excited, because he has recently begun barking at people. I guess we do have even more in common! I look forward to seeing her as she grows. Hold her in your arms and lap all you can. Gladys. I love it. So adorable. Good for you! New puppies are the best!